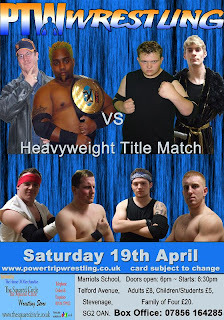 FINAL UPDATE: PTW Wrestling - Saturday 19th April - Stevenage, England! Power Trip Wrestling present "One Wild Night," Saturday 19th April 2008, at Marriots School, Telford Avenue, in Stevenage. This is the final update for the show. WHAT: Power Trip Wrestling present "One Wild Night." WHEN: Saturday 19th April 2008. WHERE: Marriots School, Telford Avenue, Stevenage, Herts, SG2 0AN. 'The Enforcers' Braddock & Frantastic challenge anyone - from anywhere!